With milling and paving operations completed, the 2018 Street Maintenance Program will begin the next phase, a citywide crack filling program. In addition to the Rivermist, Devonshire Farms, and South Point subdivisions contractors will canvass the streets listed below to identify crack filling opportunities. 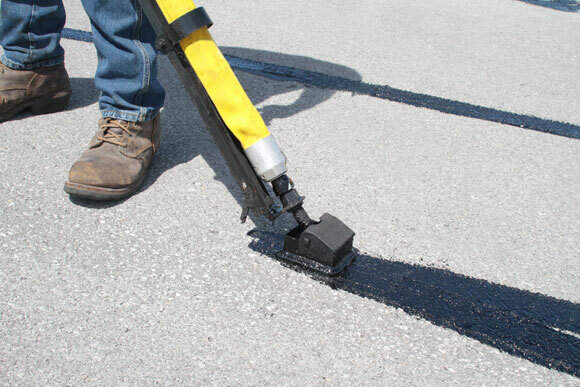 Crack filling is the placement of asphalt emulsion into longitudinal and transverse cracks to reduce water infiltration. By restricting water from penetrating the base and sub-base layers of a street, crack filling extends the pavement life and stands out as a cost-effective technique. To get the best results, prior to filling contractors use an air compressor to remove debris such as loose rock, dirt, and vegetation. A clean surface ensures the crack filling materials properly seal the crack. On June 25, 2018, City Council passed a resolution authorizing a five-year contract for the collection of refuse (garbage), recyclables, and yard waste with Lakeshore Recycling Systems (LRS). As the City works with LRS to transition from the current service provider, the City would like to take the opportunity to provide residents with an overview of the upcoming services. 1. When does the LRS contract for the collection of refuse, recyclables, and yard waste take effect? The contract with LRS begins September 1, 2018, with the first residential pick-ups scheduled for Thursday, September 6, 2018, due to the Labor Day Holiday. 2. Will the refuse services continue without interruption during the transition period? There will be no interruptions in service. LRS plans to begin delivering carts in mid-August. The current service provider will begin picking up their carts the week of August 27, 2018, which coincides with their last week of scheduled pick-ups. 3. Do I need to submit a request for the delivery of LRS carts? No requests are necessary. By default, all residents in single family and multi-family homes with an active, City of DeKalb, utility/garbage account will receive one (1) 95-gallon cart for refuse and one (1) 65-gallon cart for recyclables. 4. May I request an additional cart or a larger recycling cart? Yes, residents may request an additional 95-gallon refuse and/or recycling cart at no additional charge. Residents may also request to exchange the 65-gallon recycling cart they receive for a 95-gallon recycling cart. 5. What if I need a 65-gallon garbage cart? Senior citizens and residents living in multi-family (attached homes) may request a 65-gallon refuse cart in place of the 95-gallon cart. 6. How do I submit a request for an additional cart or a smaller cart, as described? Beginning Monday, July 23, 2018, residents may begin to submit those requests online at https://www.lrsrecycles.com/dekalb/ or by dialing the number posted on the website. LRS recommends residents with internet access submit special requests online to avoid extended phone hold times for those with no internet access. 7. May I continue using my own garbage, recycle or yard-waste cart or container? Residents may use their own carts or containers. Resident owned carts or containers must weigh less than 50-lbs, not exceed 32-gallons in size and have two handles. 8. Will my pick-up day be the same as it is now? LRS will keep the same schedule as the previous service provider. However, the time of day your collection occurs may vary during the transition phase as LRS works to increase efficiency. 9. Has the lower monthly rate resulted in a reduction of services? All core services stay the same with only one (1) exception. The new contract eliminates the City’s three (3) sites for landscape waste at Fire Station #2 1154 South 7th Street, 950 W. Dresser Road, and the southeast corner of North 7th Street and Oak Street. These facilities had become prone to abuse and misuse. 10. What are the core services included in this contract? The new contract provides three categories of core residential services. a) Garbage. The new contract includes the weekly collection of refuse. Garbage collections will occur on the same day as your previously scheduled collection day. LRS will provide one (1) 95-gallon cart as part of the service. Residents may use their own carts for extra garbage. However, they must weigh less than 50-lbs, not exceed 32-gallons in size, and have two handles. Residents may request an additional 95-gallon refuse or recycling cart at no additional charge, (refer to #4). One (1) appliance such as a refrigerator or stove may be placed out for collection each week. b) Recyclables. The weekly collection of recyclable waste is also part of the services. Collections for recyclable materials will occur on the same day as your refuse collection day. LRS will provide one (1) 65-gallon for recyclables as part of the service. Residents may use their own carts for extra recyclables. However, they must weigh less than 50-lbs, not exceed 32-gallons in size, and have two handles. Please clearly mark your cart with the word recycling to indicate additional recyclables. Residents may request an additional 95-gallon refuse or recycling cart at no additional charge, (refer to #4). c) Yard Waste. The weekly collection of yard waste is also part of the services. Yard waste collection will occur on the same day as your garbage and recycling. LRS will collect yard waste from April 1 through the end of November. Yard waste includes garden trimmings, branches and brush under two inches (2”) in diameter, leaves, flowers, tree droppings (crabapples and pinecones), garden plants, vines, weeds, and grass clippings. Place yard waste in a biodegradable landscape waste bags or open garbage cans marked with “YW or X”, not to exceed 32-gallons and 50-lbs. Brush must be cut to 4-foot lengths and bundled with biodegradable twine or string, not to exceed 50 pounds. LRS will provide annual Christmas tree collections for the first two weeks in January. LRS will offer 65-gallon and 95-gallon carts for yard waste. These are optional and available for residents to rent for a small fee billed quarterly by LRS. 11. What new services are provided by LRS? a) Electronic Waste (E-waste) Collection. Beginning October 2018, LRS will begin collecting E-Waste on resident’s first regularly scheduled pickup day of every month. E-Waste items include the following items, computer mice, computer monitors, computers, digital converter boxes, digital video disc players, digital video disc recorders, fax machines, keyboards, portable digital music players, printers, satellite receivers, scanners, small-scale servers, televisions, video game consoles, and videocassette recorders. Smaller E-Waste items may be placed at the curb in a brown paper bag or a 24” x 24” x 24” or smaller cardboard box. Please mark the box as EWASTE. E-waste should be separate from the garbage, recyclables, and yard waste containers and easy for the driver to identify. Residents with televisions and monitors weighing over 50 pounds or larger than 19 inches should contact LRS customer service department prior to the scheduled collection day. b) Household Hazardous Wastes (HHW). Beginning in the Spring of 2019, LRS will introduce a new service for the collection of HHW. LRS will collect HHW materials from your front door or driveway. More information will be provided for residents as it becomes available. c) Organic Food Scraps (OFS). During the yard waste collection season, residents may mix OFS with yard waste. Acceptable OFS include bread, cereal, coffee grounds, dairy, egg shells, eggs, fruits, grain, pasta, shells, and vegetables. 12. How do I notify LRS that my refuse, recycling, or yard waste was not picked collected? Please contact LRS at (815) 770-7550 or email your name, phone number, and address to DeKalb@LRSrecycles.com to notify customer service which waste material(s) were not collected. For regular updates, please visit our website at www.cityofdekalb.com. You may also follow us on Facebook and Twitter at @cityofdekalb_IL. Please call Patrick DiDiana at (815) 748-8135 or patrick.didiana@cityofdekalb.com with questions and concerns.